Yeah, I know. You, me and the rest of our fellow earthlings were taught there were nine planets. Well, now that it’s 2006, that data set is incomplete. 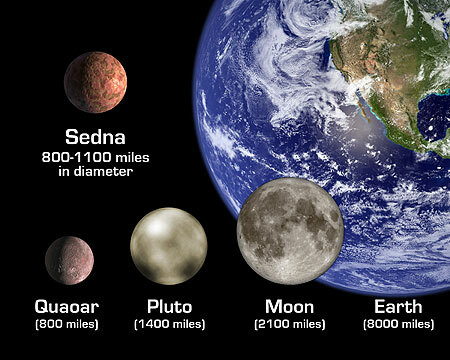 In the past few years we have discovered three more: Quaor, Sedna and 2004DW. Poor 2004DW has no name yet – but may be assigned one by the International Astronomical Union if they can collectively decide whether it is a real planet or just a poor, lower class “trans-Neptunian object'. And that’s the rub, as there always is. How small do objects have to get before they’re not planets anymore? Does size matter or does composition also matter? The IAU is now struggling with these issues. And when they’re done, Pluto herself could be declassified as a planet or perhaps, grandfathered in. In terms of distance from the sun (if 1 Astronomical Unit (AU) is 93 million miles), Earth is 1 AU, Pluto is 39.5 AU, Quaor is 43.6 AU, 2004DW is 45 AU and Sedna is a whopping 89 AU, nearly twice as far as Pluto! Stay tuned. There are a growing number of planet hunters armed with some awesome new tools looking for more. You can definitely expect to see the lost grow. It is time that the IAU get off the dime and settle the question of planetary definitions as well.